When going hiking and trekking, independent how many days you are going for, it is always good to plan your packing in advance. Unnecessary weight is always good to get rid off, bring all things you need but not all the things you want. 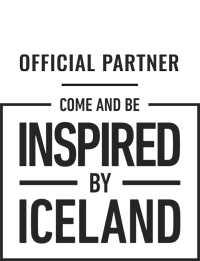 We provide both day hikes and longer multi-day treks. Be aware that this equipment list and how to pack guide is more aimed towards the multi-day tours, but hopefully, it could give you a hint on how to pack for a day tour as well. 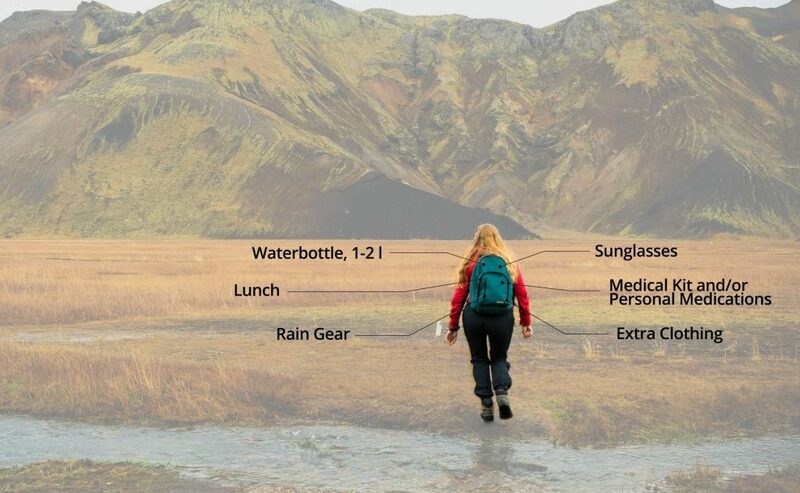 The clothing guide is suitable for any length of hiking or trekking adventure in Iceland. For most of our tours, you need to bring a small backpack, optimal 25-40 L, that you will carry on. In your day backpack, you should pack your lunch, water bottle, rain gear and other items you might need for the day such as medication, extra clothing, sunglasses, etc. For some of our tours, you will need to carry with you a pair of river crossing shoes. In general, it is always good to try to keep your pack as light as possible but still bring what you need. For our longer trekking tours, you will have to bring more necessary equipment and clothing to be able to hike for 2-8 days. Depending on the tour, your main luggage will either be staying in one hut, be transported between huts/campsites by a support vehicle, or in some tours, you will have to carry it along with you. Space is limited so we would appreciate it if you kept your luggage light and in a soft bag rather than a suitcase. This luggage, like you, will sometimes need to cross rivers so we recommend waterproof duffel bags to keep your belongings dry from the splashes. A 70-80 L bag should be more than enough. If you have extra luggage that you won’t be needing on the trek and would like to leave at our headquarters in Reykjavik for storing then you can add the luggage storage to your booking. At least one pair of gloves – wool or synthetic. A spare pair of gloves is recommended. Sleeping bag and travel pillow. Travel sack for your baggage that is transported between huts/campsites. Personal medical kit to include personal medication and i.e. band aids, throat lozenges, lip salves, second skin for blister etc. …and don’t forget your camera! Unfortunately, no single item of clothing exists that fulfills all of the demands listed above. Therefore our challenge is to find the most efficient selection of clothing that combines all of these features, maximizing performance while minimizing space and weight. Our solution lies is in the layers. When traveling in Iceland it’s good to always keep in mind, that layers are key! We have learned from experience that a 3-layer structure is the best way to go. Each layer has its own specialized role and purpose. If properly selected, these layers can act in harmony to fulfill the demands of the adventurer and the elements. A simple layering system consists of a transfer layer (base layer) next to your skin, adjustable insulating layers, and an outer shell to protect you from water and the wind. Rather than a few warm and bulky garments, we recommend a selection of lighter and more versatile pieces that can be worn in various combinations to better manage the wide range of conditions that you will encounter in Iceland. Worn directly against the skin, this layer is designed to move or “wick” perspiration away from your body, thus keeping you dry from the inside. When this layer gets wet (from sweating), it is important that it maintains its insulating value while minimizing absorption. For this reason, it is generally made of wool or synthetic materials, and never of cotton. Since this layer is directly in contact with your skin, comfort is also paramount, so consider something that avoids rubbing in sensitive places. Consider packing an extra set so that you can use one for hiking and the other for comfortable evening relaxation and sleeping. This is the most versatile of all layers and will be determined by activity levels as well as the outside environment. The purpose of the insulating layer is to manage body heat appropriately. Light and medium weight fleece jackets are ideal during the day when activity levels are higher and daytime temperatures are warmer. Hiking pants should be made of light, strong, and quick-drying fabrics. Fleece pants or expedition (heavy) weight long underwear also works well. Again, garments made of cotton such as jeans are a poor option, for their lack of ability to manage moisture. On cold days and during the evenings, two insulating layers work well together to provide extra warmth. A down or PrimaLoft jacket is also a good idea to bring along, for quick access to warmth during stops and lunch breaks, as well as a light and comfortable layer for relaxing in the evenings. Examples: toque/hat, gloves, fleece sweater/jacket of all weights, hiking pants. This layer is mainly meant to protect you from the two most threatening elements: wind and rain. The other critical function of the outer shell is the ability to allow moisture to escape or “breathe”, so as to prevent you from getting wet from the inside as a result of your own perspiration. Additional features such as hoods and zip ventilation systems allow for more precise adjustments and help to maximize warmth and comfort in the outdoors, although they are not essential. It is very important that jackets and pants in this category be waterproof, windproof, and breathable. Keep in mind that favorable weather conditions may often be such that the use of the outer shell is not needed, however it is always wise to have this layer easily accessible as conditions can change quickly. A warm toque/hat made of wool or synthetics is recommended. A lightweight sun hat is a good idea on long and sunny summer days in Iceland, as are sunglasses, especially when hiking on snow and water. A rain hat or hood will help to keep your head dry in wet conditions. For a guide to under-shirts and sports bras see Transfer Layer (Base Layer)/1st Layer above. For light, medium, and expedition (heavy) weight sweaters and down and PrimaLoft jackets see Insulating Layer/2nd layer. Information on wind and rain jackets can be found in the Outer Shell/3rd Layer section. Light gloves are generally enough for summer conditions, and wool and fleece will still keep you relatively warm when wet. Waterproof over mitts are optional but could easily come in handy in wet or snowy environments. For underwear and long underwear see Transfer Layer/1st Layer above. For hiking pants see Insulation/2nd layer above. For wind and rain pants see Outer Shell/3rd Layer above. We recommend that you bring merino wool socks (or similar) designed for hiking. As discussed in the Transfer Layer (Base Layer)/1st Layer section above, these will maximize comfort by keeping your feet dry. We also strongly recommend bringing two or three extra pairs in case they get wet or simply for a comfortable change of socks when you reach camp. Inner liners, a thin pair of socks you wear underneath your normal hiking socks, are also nice to prevent rashes and uncomfortable blisters. No cotton socks please (Are you noticing a pattern?). Once in camp after a long day of hiking, it is nice to be able to take off your hiking boots and put on a pair of loose, comfortable camp shoes to rest your feet. Sandals, moccasins, or other lightweight footwear are a good option. For all our Laugavegur trekking tours, we will be crossing at least one creek/river most days, all of which involve rough, slippery riverbeds and frigidly cold water. In order to make these crossings safely, you will need a separate pair of shoes for stream crossings. Quick-drying trail runners, sandals (with straps! ), old sneakers or neoprene booties are the best options. Crossing these rivers in bare feet is not advised by any means! Neoprene socks can also be a good option to help protect you from the cold waters. On the warm sunny days, you may wish to change into a pair of shorts to cool of and catch an Icelandic tan! If you tend to favor shorts, we suggest considering bringing gaiters, as we will surely encounter snow and muddy crossings. Orthotics are also an optional comfort for long treks to ease the stress on the feet and lower legs but should be purchased and fitted under the guidance of a specialist. A neck tube can be useful in protecting precious body heat from escaping, especially if you often find yourself susceptible to cold winds. consider the need for each item. As you strive for the lightest possible pack, ask yourself the following questions: Do I really need it? Will it serve several functions? Is there a lighter option? Can I share the item with someone? Is there room for food, extra garments, and group gear/snacks in my pack? One way to reduce weight without giving up anything important is to manage quantities by bringing the bare minimum for the duration of the trip. Your goal is to take what you absolutely need and not much more. Trekking pole/s are optional but can be useful when encountering terrain with poor footings, such as stream crossings, rocky trails, loose scree, slippery mud, etc. They also ease the load on your legs during uphills and downhills, especially if you have a heavy backpack and/or weak knees. Trekking poles come in all types, sizes, and prices. Some are incredibly light, adjustable in length and packable, whereas others include features like shock absorbing tips or camera mounts. Your choice will depend on your needs. You can also spare the room in your luggage and rent a pair from us. or top of the line synthetic bags. For the camping experience, you will need at least a 0°C rating. We don‘t require any specific rating for the hut tours since they are heated up. Any warm sleeping bag will do just fine on these kinds of tours. stretch we encounter without a water source is approximately 4-5 hours. For this you will need at least 1 liter of water, so please ensure your bottle or container is at least this size. While hiking, it is important to drink water, more water, and then even more water! 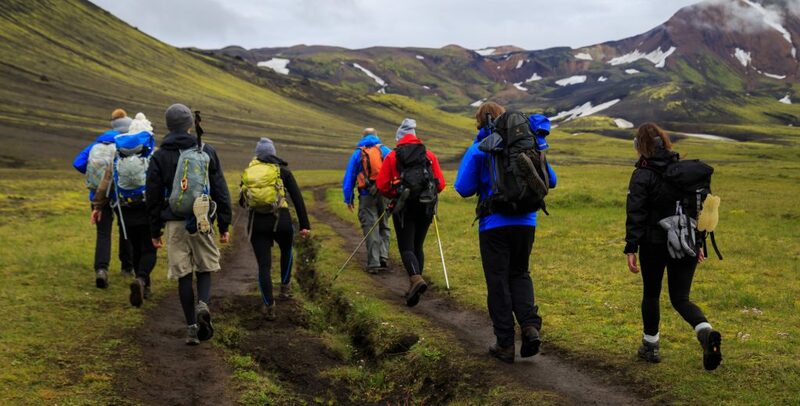 In Iceland, it is all too common for people to not drink enough fluids while hiking, usually because of the cold temperatures in the highlands that tend to suppress thirst. Dehydration is a serious, but easily preventable condition, so remember to drink water even when you’re not thirsty! No hiking or trekking tour to pack for yet? 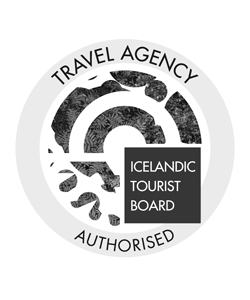 We have divided our hiking and trekking tours into 3 categories, Hiking tours, Trekking Tours and Laugavegur Trek. All to make it easier for you to find the perfect adventure. In this category, you’ll find day hikes with different locations and different levels. 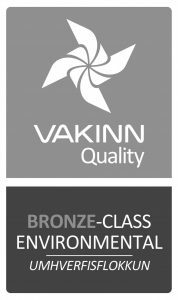 All of the tours are available with pick-up and drop-off in Reykjavik. If you are looking for a longer adventure, Trekking is your activity. Here you’ll find trekking tours with different locations and different length. Some of the tours are with camping in tents and some with stay overs in huts. 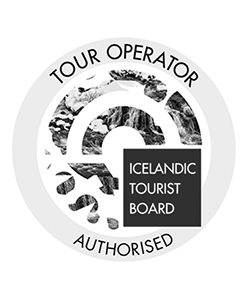 This is the most popular trekking trail in Iceland, in this category we have collected all our different versions of tours to Laugavegur.